Decisions, decisions! Of the many decisions that you’ll need to make, choosing the right design for your bridesmaids is quite a big one. Though before we go any further, let’s have a look at the essentials of choosing the right bridesmaid dress. First of all, and probably most important of all, it helps to have an idea of your budget for the dress. Normally, your bridesmaids will be paying for their own dress so it’s definitely a good idea to know how much they are willing to spend and maybe sound it out with them first. If you are paying for the dresses, then have a figure in mind for your overall costs first before you start browsing online. You’ll know from doing the research on your wedding dress that you need to order your friends dresses well in advance. Typically you will be looking at 2-3 months for orders to arrive then there’s the inevitable alterations and those can take at least 4-6 weeks. Ideally 6 months should give you and your girls plenty of time to source, order and eventually alter the dresses. Six months sounds like a long timeframe, but these things always take longer than you think. Normally a bridesmaid dress is made according to your largest measurements, which means that your girls will probably end up buying dresses a whole size bigger than they would normally buy. Should one of your friends wish to pick up a size smaller, it might be an idea to let her know that is it always easier to make alterations to a dress if it is too big rather the other way round. If the dress arrives and it is way too small, it will mean having to order a new dress and that is not ideal given the timeframe! Your maids dresses need to work with the design of your dress and ideally they should tie in with the overall design and colour palette of your wedding. Also, it’s important to select a colour that complements all skin tones. Soft washed out pastel colours including grey, sand, blush are generally very flattering for most people. Green tones tend to work well for people with fair complexions though bright bolder tones will definitely pop against darker skin. On trend this year and last are metallic colours such as bronze, silver, gold and champagne. If you’ve seen a print design which you like, ideally the dominant colours will need to work across the whole colour palette and design of your wedding. Two Birds have been on the scene for a while now and their super stylish, modern dresses are very flattering and just look great on! 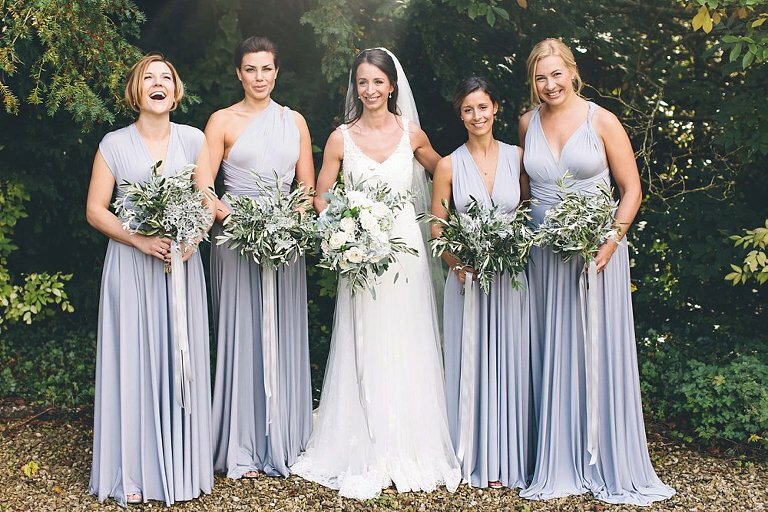 They were one of the first designers to create a bridesmaid dress that ties around. Here you can see a Cote D’Azur wedding I shot featuring Two Birds dresses and another is a lovely Wedding at The Rectory. Maids to Measure are a London based designer who have really cornered the market for beautiful ready to wear dresses at very reasonable prices. Though as the name suggests, they also create bespoke dresses to order which are slightly more expensive. Here is Jo & Ryan’s Hedsor House wedding featuring their gorgeous designs. Clare & Richard’s wedding at Northbrook Park also had Maids To Measure design their dresses. Ghost dresses are synonymous with gorgeous flowing fabrics and lush modern lines and their maids gowns are as you’d expect. A relatively new player to the wedding market, Ghost dresses are surprisingly affordable and are definitely worth a look. Here’s a link to view Sheyi & Simon’s stylish wedding at Hampton Court House that I photographed. Towards the luxury end of the market are Coast dresses. 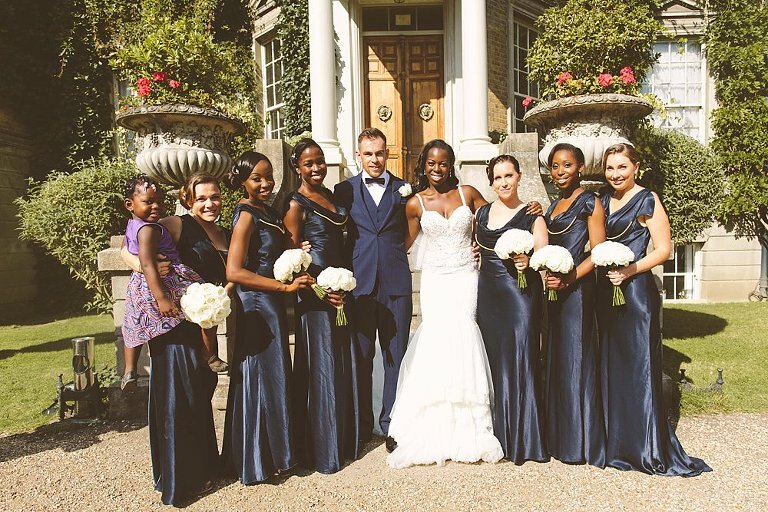 They’ve specialised in evening dresses for a while and their collection of bridesmaid dresses are gorgeous. Georgina & Alex’s wedding at The Walled Garden at Cowdray featured Coast dresses which went down a hit! Ansty & Joe plumped for Coast for their Brompton Oratory wedding. Alfred Sung has been catapulted from a largely unknown designer to one of the biggest names in bridal wear and his contemporary bridesmaid gowns are divine and very reasonable. From long flowing full length designs to floaty chiffon numbers, from pretty prints to shorter knee high length creations, Alfred Sung seems to have thought of everything for the modern maid. Megs & Mo’s Wiltshire wedding, Lucy & James’ Bocconnoc House wedding, and Liz & Leigh’s Provence wedding all feature Dessy dresses. ASOS now have a huge range of dresses on offer and they are very reasonably priced. Their Maxi dresses start at £45 and look incredible for the money. Michelle & Gary had their wedding photos at Botleys Mansion last year and the ASOS dresses looked beautiful. New York based Amsale Aberra is a world renowned designer known for her simple, effortless elegant designs. Her work is very contemporary and yet evokes a feeling of old school glamour. Krissy & Paul’s Sudeley Castle Wedding in The Cotswolds has Amsale designs. And last by no means least we have the very gorgeous wrap dresses from designers Eliza & Ethan. They’ve created a very clever ‘one size fits all’ design in a range of 22 beautiful on trend colours in a non crease fabric. Genius! Charlotte & Kieran Wedding Photography at Caswell House feature Eliza & Ethan dresses.